VoIP (Voice over IP) - is transmission of voice over CSUs data network (same one our computers are connected to) using the Internet Protocol (IP). This is also known as IP Telephony or Internet telephony. 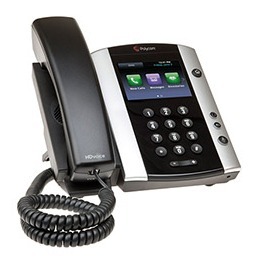 Instead of using separate telephone lines, VoIP uses our network to transmit phone calls. If your VoIP phone is powered down (or re-booted), or its data cable is un-plugged from the wall port, your computer will also lose its network connection. If there is a power outage in your building your VoIP phone will no longer work. Each building will have at least one emergency VoIP phone that will operate in the event of a power outage. Cabling: new buildings at CSU do not require separate phone and network cabling. This reduces costs. Moves and changes: The VoIP phone system, moving phones from one location to another will simply involve plugging a phone into the network outlet in the new room. Cross campus features: Allows call queues and hunt groups to operate across multiple campuses. Your phone number becomes portable you can login to any phone on any campus and make and receive calls from your number. Unified Communications: Integrates with email so you can receive voicemails by email. Presence: You can make your current presence information available for other staff to see, (for example: busy, do-not-disturb, away, or available). This means that if you use your computer to manage calls, it is possible to see when a person you are intending to call is already "on the phone", or otherwise unavailable. Mobility: You can route calls to various destinations, for example, mobile phone, computer or home phone when working from home. Some features in the following guides are only available to staff with elevated privileges. Interaction Client .NET Edition provides an easy to use window to manage phone calls, call queues and directories. Its features include Call History Management, Unified Messaging, Interaction Fax and Soft phone capabilities, ACD (Automatic Call Distributor – for call queue functionality, speed dial directories and conference calls. Interaction Client offers a range of (presence management functions) eg allows the end-users to always see the current status (on the phone or in a meeting etc) of other users in the same company or workgroup. Interaction Connect is an interaction management application for call control at CSU. It offers more functionality then a standard telephone. In addition to making and receiving phone calls, it is used to manage voicemail, conference calls, phone queues and web chats. Interaction Connect can be accessed via Virtual Desktop Infrastructure (VDI) or by using CSU computers on the CSU network either on campus or via Virtual Private Network (VPN). Receiving and sending faxes in the Interaction Fax is as easy as opening an email message or printing a document. When you receive a fax, it appears as an attachment to an email message in your inbox or your sections generic mailbox. Interaction Fax is provided for free from the Install Software icon on CSU owned computers. The CSU Computer Shop provides pricing details for telephones and headsets. Complete the order form on their website to purchase a telephone or headset.